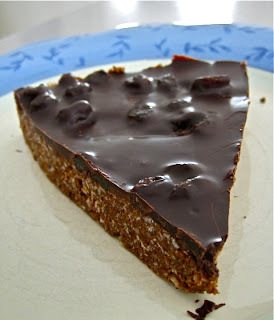 As I promised last week, here is another delicious protein bar! 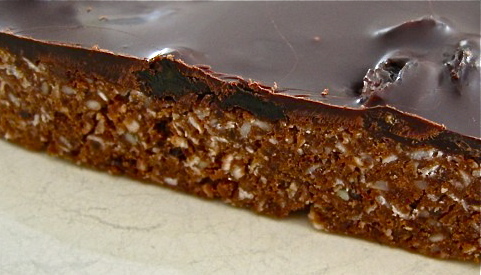 These are a spin off of my favorite Nourishing Protein Bar recipe. I was in a rush to make them, felt like experimenting, wasn't in a "recipe mood," so I just started throwing some ingredients together. I never officially wrote down the recipe measurements since I decided to wing it, but here are some estimates. Most of my bar recipes are very forgiving and you can always adjust if the "dough" is too wet or too dry, by adding more oil or nuts. It's fun to experiment in the kitchen! 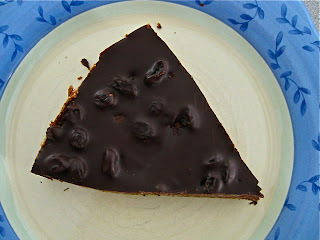 Raisins and chocolate = yum! 2. Press down hard into a baking pan (I used a round cake pan). Sprinkle raisins on top and press in those too. 3. Melt chocolate over a double boiler. Pour over pressed down bar mixture and spread evenly with a cake spatula. Freeze or refridgerate until chocolate is hard. Let bars warm to room temperature for at least 30 minutes before slicing. Since I used a round pan, mine came out like wedges! Have a happy healthy snack (and dessert)! I love these bars. 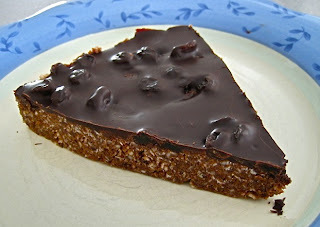 They really satisfy my want for chocolate, healthy fats and a slightly sweet treat all in one bite! I love Passionate Homemaking's Protein Bars- yum! The changes you made sound delicious too! Thanks :) It looks like such a long ingredient list - but it couldn't be more easy - just throw it all into the food processor! I love sunbutter! These look delicious! this looks absolutely amazing!!! what a great recipe! I seriously am bookmarking this so I can try it out! yum! I've never had sunbutter before, but I have a bunch of already soaked and dehydrated sunflower seeds I need to use - can I just grind them into a paste and use? I love how you sliced these up like pie - makes it seems a bit more decadent somehow! "Good For You" Hot Cocoa. All content property of Mutritious Nuffins. Simple theme. Powered by Blogger.